Another great article about WWHR by Build Energy featuring Power-Pipe. See full story below. Several housebuilders are now fitting Waste Water Heat Recovery (WWHR) systems to new homes as a way of achieving Part L target carbon emissions. Redrow Homes using Power Pipe products is just one example. 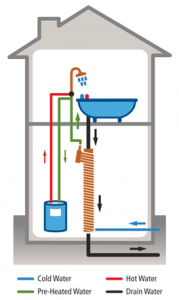 As talked about in a previous blog, WWHR systems work by capturing much of the heat from a shower’s waste water and transferring it to the incoming cold water, thus alleviating the output required by the boiler. How does WWHR help in SAP? Housebuilders are finding WWHR systems to be an attractive way of meeting Part L emissions targets as they are a cost effective technology which achieves significant performance gains in Standard Assessment Procedure (SAP) calculations. Power-Pipe UK claim that adding one of their products to a SAP calculation will result in an improvement in emissions of 2-7% depending on the size of the unit. They offer 64 different SAP listed models based on two diameters (50mm or 100mm) and multiple lengths (610-2130mm). This can equate to a cost saving, in a typical family home, of £80-£100 per year and a carbon dioxide saving of between 300kg-1000kg per year.